Sooners' head coach has guided OU Football to 149 wins, 14 straight bowl berths. 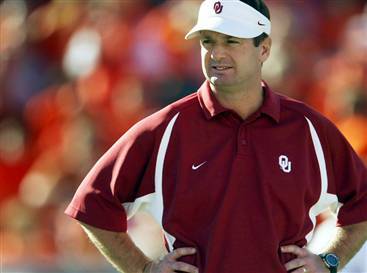 NORMAN, Okla. -- University of Oklahoma President David L. Boren announced today that the contract of head football coach Bob Stoops will be extended through the 2020 season. Boren will recommend that the OU Board of Regents take formal action at their September meeting. "We took this action to express the University's deep appreciation for Bob Stoops' work," Boren said. "In my opinion, he ranks among the very best nationally in the way he combines his ability as a coach with high ethical standards. I greatly value and enjoy my association with Bob and feel extremely fortunate that at the University of Oklahoma we have the longest continuous tenure of the current head football coach, athletics director and president. "The progress made in our football program since Bob took the helm in 1999 is remarkable. He has truly revived one of the great college football traditions, while adding his own enhancements, and elevating the profile and competition in the Big 12 Conference. As president, it is particularly meaningful to me that we have a coach who has accomplished so much and with such high personal integrity. His strong character represents the best of the values of our university. I'm always proud when he represents the University of Oklahoma to the nation." OU Vice President and Director of Intercollegiate Athletics Joe Castiglione cited Stoops' leadership and the foundation he has developed for future growth. "Anytime I look at Bob Stoops on our sideline surrounded by our student-athletes and coaches, I'm reminded of the truly exceptional coach he has become," Castiglione said. "Whether it's his inspirational leadership, his passion for the game or consistently putting his team in the best position to be successful, his character and steely resolve continue to make him the right person to lead us to success in the future. "Coach Stoops has become one of college football's iconic figures yet he is a selfless man who remains focused on winning championships adding to our program's great legacy. Against that backdrop he has also quietly embraced the role of serving others and encourages similar values amongst his players and staff. I am proud to have worked with him continuously for 15 years and excited we can extend our relationship with him. We will continue to build on the incredibly strong foundation and tradition which exists at the University of Oklahoma and pursue the many great things we want to accomplish in the coming years." Stoops, the only active coach with a winning percentage higher than 80 percent with 14 uninterrupted seasons on the FBS level, said the relationships he enjoys at Oklahoma are special. "I appreciate the University's commitment to our program and me," Stoops said. "Most coaches dream of working in the kind of situation that exists at Oklahoma, especially with leaders like President Boren and Joe Castiglione. We're proud of what we have accomplished to this point and look forward to achieving a lot more." Stoops, who reached 100 coaching victories faster than any NCAA Division I coach in the modern era, is about to enter his 15th season at OU. During that time, he has compiled a record of 149-37 (.801) with a BCS National Championship in 2000 and eight Big 12 Conference titles. His record in Big 12 games is 99-23 and he is 81-5 at this home field. Stoops' program has produced 65 NFL Draft picks, 33 First-Team All-Americans and 18 national award winners, including two Heisman recipients. All of his teams have appeared in bowl games and each of the home games during his tenure have registered sell-out attendance.